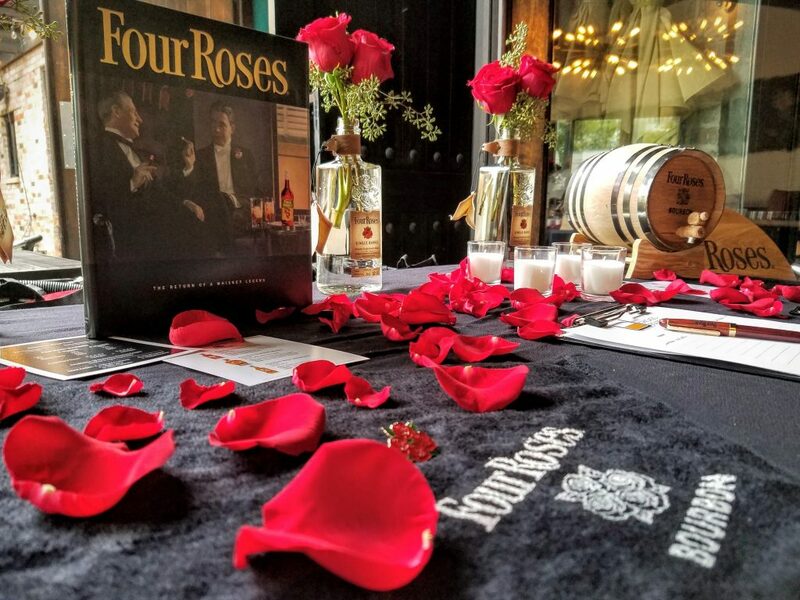 Our Four Roses tasting event held on September 29th, 2016 was a huge success. Thanks in part to The Rookery restaurant and Four Roses Bourbon. This recap of the event comes to us from our own contributing writer Jordan Leasure. 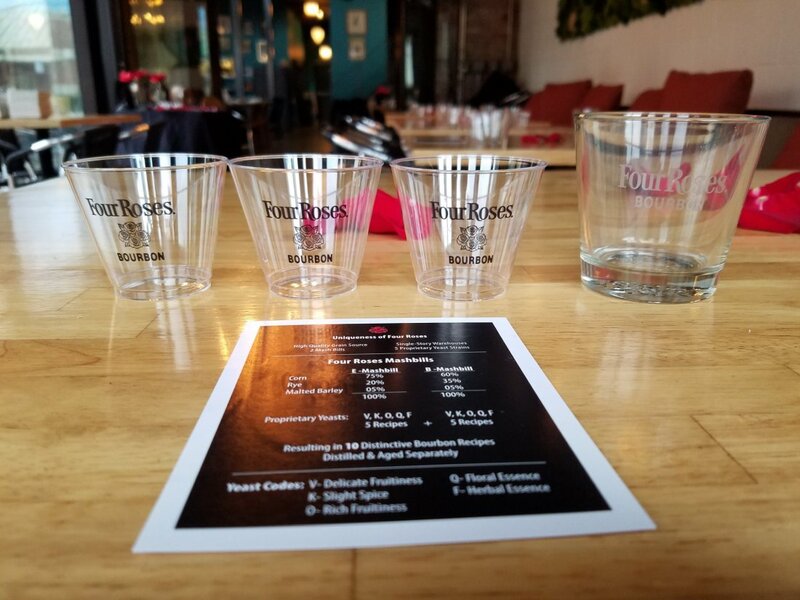 Chicago Bourbon hosted their inaugural Four Roses tasting at the Rookery last month and it was a huge success! We were at capacity with just over twenty thirsty participants and everyone left with a lot of knowledge, a satisfied palate, an amazing swag bag and a little surprise to close out the night! Being seven months pregnant I didn’t get to participate but I did have a fantastic front row seat to the action. 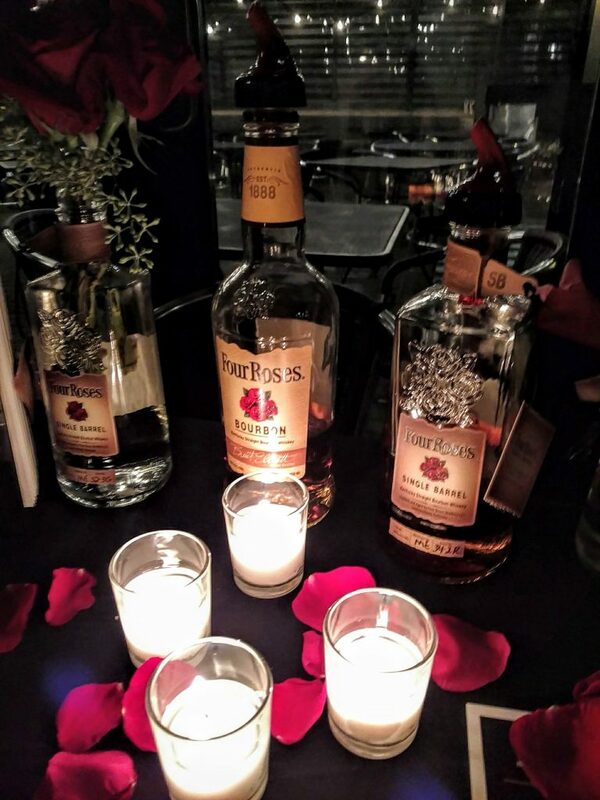 Four Roses has been a good friend to Chicago Bourbon over the years. We just got back from a trip to Kentucky and a backstage tour of their new distilling plant. We learned some great history which Chicago Bourbon founder and host William Reigle was able to share during the tasting and some terrific stories about getting the new 40 foot still into the building. Or rather building the distillery around the still! 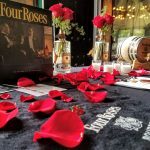 It’s always the goal of our events to provide more than is anticipated and the Four Roses/Rookery event was no different. Arunas Ingaunis, Ambassador at The Rookery, welcomed guests at 7pm with a cocktail including Four Roses Yellow. Attendants were able to mingle, snack on appetizers and meet our founder and host for the evening William Reigle. 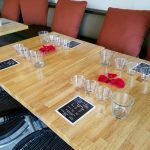 A few things William taught us that evening were that there are no wrong answers when it comes to nosing and tasting Bourbon. We’re all individuals, have different experiences and will pick up on different things. What he did outline is that we need to pay attention to five characteristics. 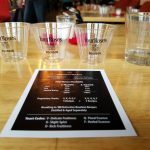 How does the Bourbon look, smell, taste, feel and sound? Sound: Does it speak to you? To begin nosing William recommended raising the glass to your chin and slowly bringing it to your nose until you can smell it. Inhale with short breaths through your nose, while keeping your mouth open. Take your time and appreciate the bouquet. Up to 95% of our perceived taste comes from our sense of smell. Spend some time nosing the glass before taking that first sip. And continue to nose as you drink; nuanced notes will change as time passes. When you move to tasting you want to do it as gradually as you did the nosing. Take a small sip, swirl it around your mouth and then just hold it without swallowing. After swallowing take another larger second sip. Then inhale through your mouth and nose. Take note of what you notice. Wet grass, chocolate, nuts, butterscotch, vanilla, cherries. As you switch from sample to sample or drink to drink do something funny….smell your arm! It will reset your sense of smell and allow you to discriminate between the samples. 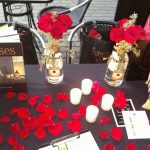 On tap for the event were the 3 Four Roses staples which we nosed, tasted and were educated on. 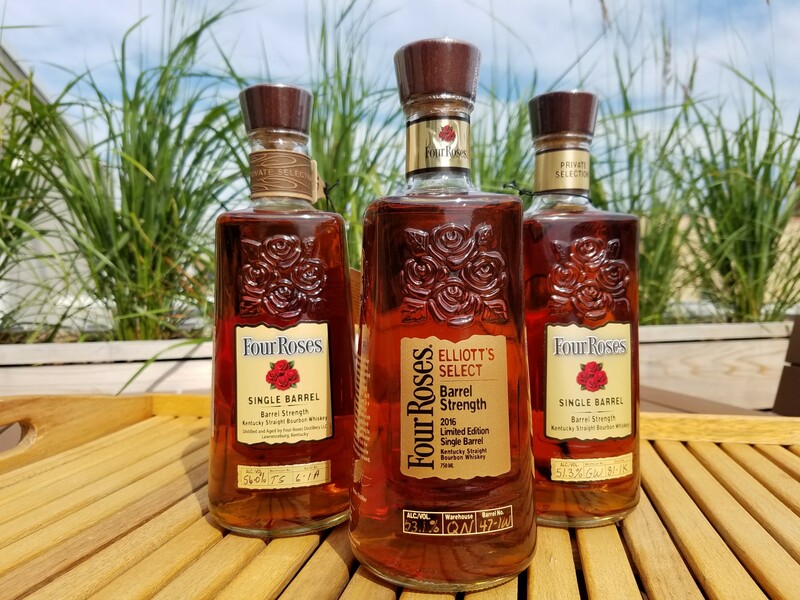 Four Roses Yellow, Small Batch, and Single Barrel. William taught us the nuances of both the scent and taste as well as the best uses of each. 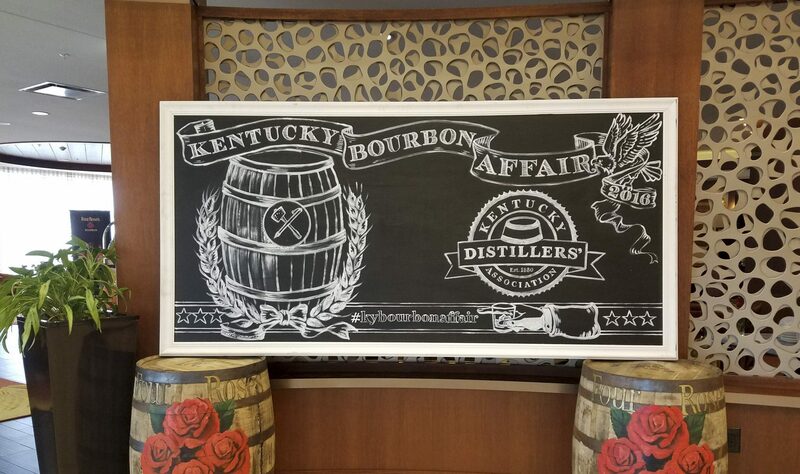 Those in attendance ran the gamut in bourbon experience. 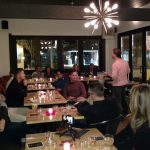 From novices who never really understood bourbon but had a deep appreciation upon leaving; to those in the industry including Bourbon.com founder David Wieland and our own Chicago Bourbon contributor, Jacqueline Rice. 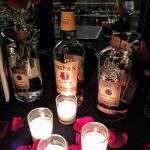 Left to right: Four Roses Yellow, Small Batch, and Single Barrel. 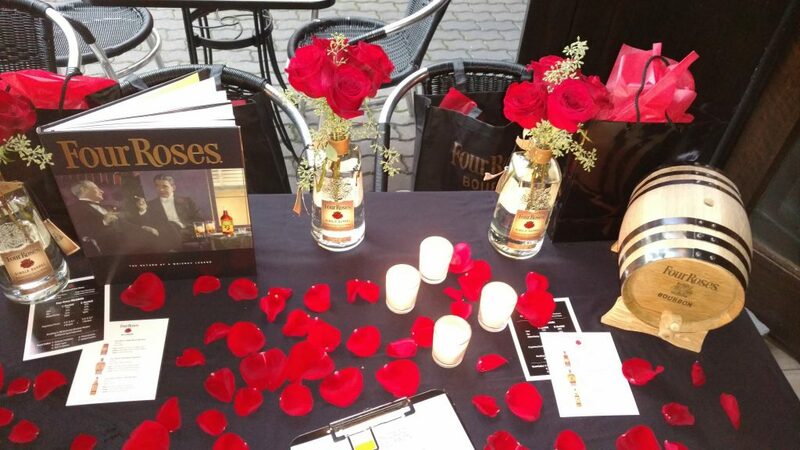 Yellow is the most readily available of the Four Roses catalog. 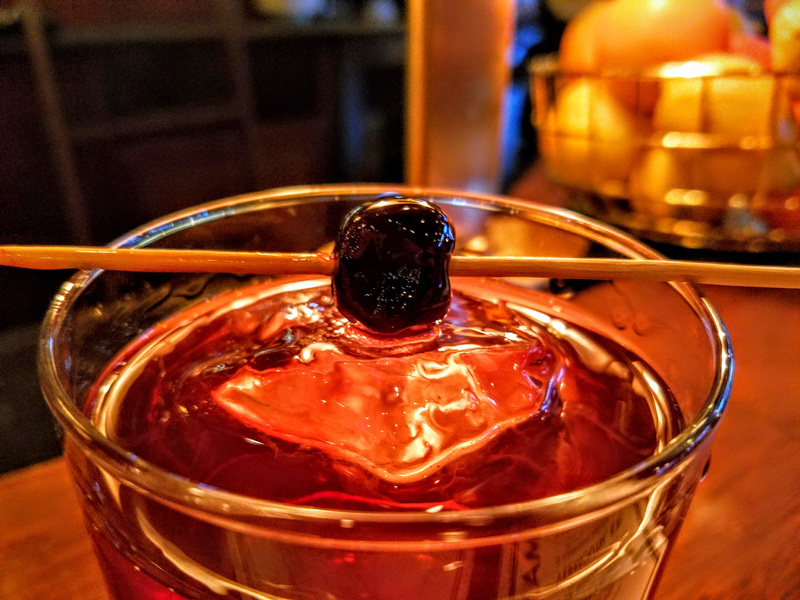 It’s perfect to mix in drinks, whether in an Old Fashioned or Boulevardier (a bourbon Negroni). Yellow is bottled at 80 proof. It has a nose of sweet fruit, vanilla, butterscotch, and sugar. With a light palate consisting of those same notes without too much spice or heat. We then moved on to Small Batch which is a blend of four of the ten Four Roses recipes (OBSO, OBSK, OESO and OESK). It has a slightly higher alcohol content at 90 proof. A nose of cherry, rich fruit, cocoa, and vanilla come through. There is less forward sweetness and more of a rich velvety sweetness on the palate. This one is more complex in character than the Yellow. Our last installment from the Four Roses catalog was Single Barrel. 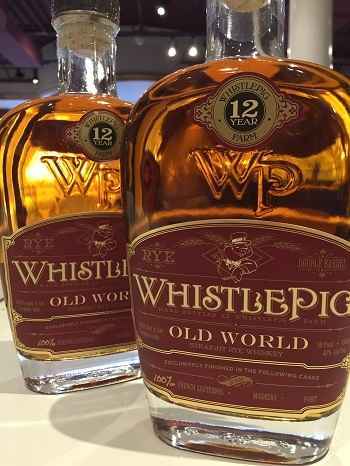 It is just one recipe from one barrel and bottled at 100 proof. The standard bottling is always the OBSV recipe. William favors this recipe but I like to shake it up with the Private Selection OBSO. Which is funny because I’m not typically a rye fan and this recipe is heavy rye. But it is described as slightly fruity, and a little spicy. Just how I’d describe myself! You might see a “Private Selection” Single Barrel which is hand-picked, by Binny’s for example. 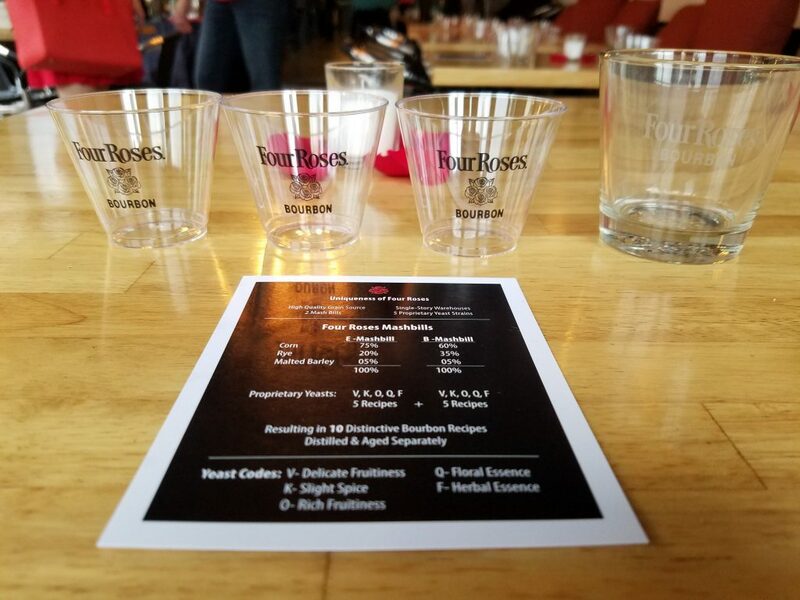 We had the chance to taste different recipes straight from the barrels at Four Roses, which I highly recommend. Those can be any of the 10 recipes. The Single Barrel has a complex nose of a blend of fruit and rich cocoa, very well-rounded with strong chocolate on the palate and a deeply evolving finish. The evening concluded by William surprising us all by bringing out an impossible to find bottle of Elliot’s Select – personally selected for Four Roses by master distiller Brent Elliott. It is a Limited Edition, single barrel bourbon and this was Brent’s first limited edition release as master distiller. Brent Elliott, who assumed the post of master distiller in September 2015, hand-selected the 14-year-old OESK, one of the Distillery’s 10 unique Bourbon recipes. Elliott’s Select flanked by two other Private Selection barrels from the distillery. It was a fun night, informative and entertaining. 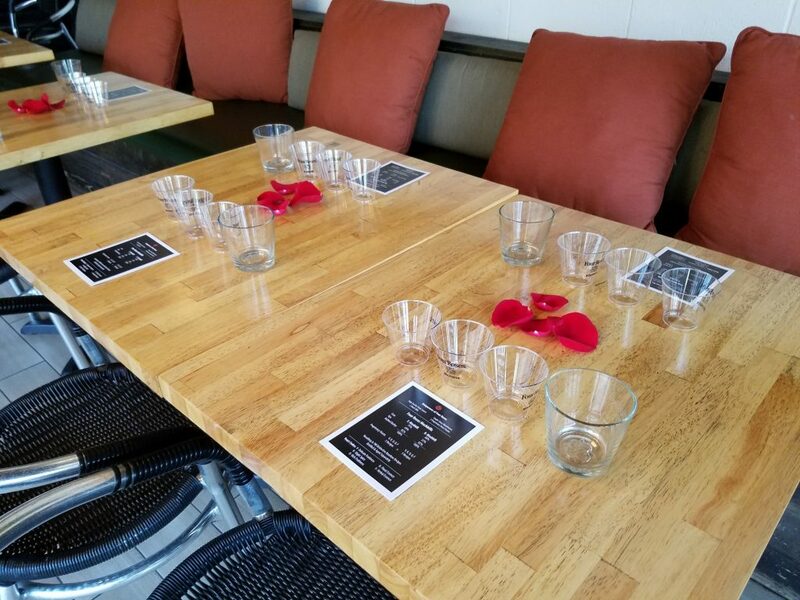 Everyone learned a little more about William and Chicago Bourbon as well as the current Four Roses catalog. We had some help in making the evening so unforgettable. Thank you to Daniel Dugo with Joseph’s Florist, Brian Krieger with Four Roses and the proprietors and entire staff of The Rookery. If you haven’t yet been to a tasting hosted by Chicago Bourbon subscribe to our mailing list below to be notified about future events! 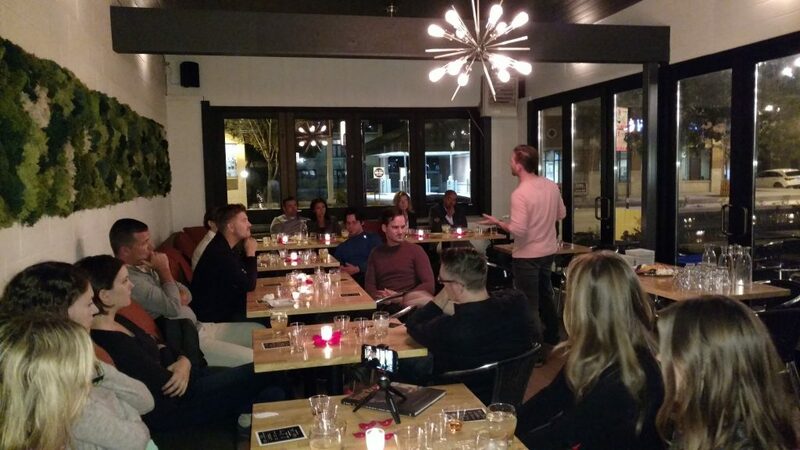 The Whisky Extravaganza is Coming to Chicago!